Open Box Remo Crimplock Symmetry Skyndeep D2 Conga Drumhead Calfskin Graphic 9.75 in. Remo Skyndeep graphic conga drumheads are made by embedding ink into the drumhead material for the organic look of calfskin. 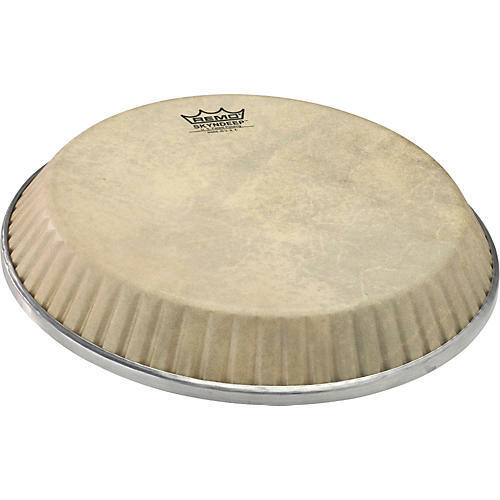 The integrity of the drumhead is maintained for warm, crisp, vibrant tones. Crimplock Symmetry adds flexibility into the drumhead's size, meaning Crimplock Symmetry drumheads can fit more conga drum models from the various drum manufacturers in the industry. With Remo's advanced drumhead technologies and input from the best percussionists in the world, they have improved the sound and feel of replacement drumheads. Remo synthetic drumheads provide easy tunability, durability, and playability-giving the world's top drummers the tools they need to play their music.